GWADAR, Pakistan - Witnessing increasing business for his bank in Gwadar port, a formerly remote fishing village in Balochistan province in southwestern Pakistan, Shakeeb Yusuf said he made the right choice as the robust business growth helped pave the way toward his promotion. Yusuf has been promoted to the full-time manager of Habib Bank Private Limited's (HBL) branch at the port's free zone after he managed to sign contracts with international business groups to handle their finances in Gwadar. The manager, who was introducing his bank's products and services Friday at a booth set up at the second international exposition held in the port's free zone, told Xinhua that his branch has opened at least seven active company accounts and over 500 individual accounts during past year. The companies and individuals entered the free zone in the first quarter of 2018. "We started business here after our analysts saw a great potential following the speedy development in Gwadar during the last five years, which turned a barren place into a proper port city," said Yusuf, adding that the development of the port and its free zone is leading it toward industrialization and becoming a regional trade hub, a prospect which can boost their business many times. The HBL, the largest bank of Pakistan, was the first Pakistani bank to open a branch in China in 2017 and was allowed to handle end-to-end Chinese yuan transactions. It has proudly claimed to have facilitated around $6 billion for projects under the China-Pakistan Economic Corridor, or CPEC. 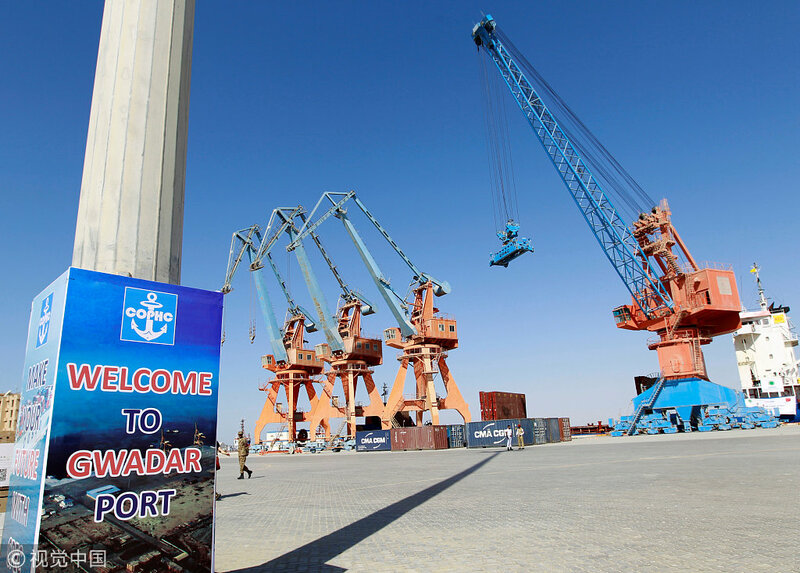 Gwadar, a small fishing town located on the Arabian Sea, has achieved several development milestones such as regular departures and arrivals of shipments at the port and the creation of a free trade zone under the CPEC. Pakistani Prime Minister Imran Khan broke ground on Friday for the construction of the China-funded New Gwadar International Airport. Khan praised the speedy and quality work by the Chinese companies and individuals in Gwadar, adding that Gwadar has become an engine of growth for the country. The new airport project, to be completed in three years, will have the capacity to handle the world's largest planes like the Airbus A380. According to the China Overseas Ports Holding Company, or COPHC, the operator of Gwadar port, dozens of companies in industries such as hotels, banks, logistics, food, steel, fish processing and renewable resources have entered the free zone. Chairman of the COPHC Zhang Baozhong said that several Chinese investors and Pakistani businessmen have reached their cooperation agreements on the sidelines of the expo in different fields which would bring mutual benefits. Zhang said that there is a lot of scope to invest in Gwadar and he was told by Chinese investors that they can import goods such as marble and seafood from Gwadar.